All of these breweries are approximately two hours or less from Calgary. Banff Ave. Brewing Co. is located approximately an hour and a half from Calgary. Photograph by Magnifik Media. If there’s one thing Alberta breweries all have in common, it’s that they’re passionate about creating craft beers. While Calgary has plenty of breweries that we love, there are also several new and established breweries worth checking out outside the city and across Alberta. Here are 10 breweries within approximately two hours of Calgary that you should visit. Parent company Bear Hill Brewing Co. runs Banff Ave. Brewing Co., Jasper Brewing Co., and Wood Buffalo Brewing Co. in Fort McMurray. The family-friendly Banff Ave. Brewing Co. features an extensive menu that includes warm buttered soft pretzels and a spicy bison chili, plus a kid’s menu for little ones. Sit out on the patio and sip on the crisp Banff Ave Blonde Ale or try the Belgian-style Norquay 92 Cranberry Orange Saison that features citrus and cranberry flavours. This brewery has been crafting beer since 2014. Blindman Brewing recently left its mark by placing in six categories at the 2018 Alberta Beer Awards (most notably tying for third in the Brewery of the Year category) and earning several awards (including four golds) at the 2018 Canadian International Beer Awards. Make the drive to Lacombe to enjoy a pint of the award-winning New England Style Pale Ale in the brewery’s taproom, where you can also get flights, snacks and coffee. Going on a getaway to the mountains? Then you should stop at Canmore Brewing Company, which placed in two categories at the 2018 Alberta Beer Awards. The growing brewery recently added new triple-batch fermentors to its fleet of brewing equipment, allowing the brewery to double its capacity. And if you happen to stop by the brewery’s tasting room on a weekend this summer, you can enjoy a savoury pie from Pie Junkie while sipipng on the 10 Peaks Pale Ale. It may be the farthest brewery from Calgary on this list, but Coulee Brew Co. is definitely worth the drive. Coulee Brew Co.’s 16,000-square-foot facility features a brew pub called Taps Grill that serves a smoked brisket dip, buffalo chicken pizza, chicken and waffles, gumbo and more. Coulee’s beer has earned accolades at the 2018 Alberta Beer Awards and the 2018 Canadian Brewing Awards. Brewery tours run every Saturday at 1 p.m.
Airdrie’s first microbrewery offers tours every Saturday at 3 p.m. You can try beer samples from the production floor during the tour and a pint afterwards. Stop by the tap room for a pint, light snacks and to fill your growler with the East Lake Amber, which earned a gold at the 2018 Alberta Beer Awards and a bronze at the 2018 Canadian International Beer Awards. The reasonably priced snack and beer menu features pints for around $5 and snacks like beef jerky, pizza pops and smoked meat paninis. A short drive from Calgary, this brewery and restaurant has a lot to offer. On Thursdays at 6 p.m., Half Hitch holds Cask Nights where you can try unique takes on Half Hitch’s brews (past flavours include Fire N’ Fury Peanut Butter N’ Jelly Time, Pina Colada Farmers Daughter and Shotgun Wedding Cake). Not into the fancy flavours? No big deal. Sip on a cold pint of the originals and feast on a brisket sandwich, bacon wrapped meatloaf or crispy dumplings. The Olds College Brewery is a learning environment for students in the Olds College Brewmaster and Brewery Operations Management program. This brewery doesn’t have a tasting room you can visit, but if you’re in the Olds area, its retail store is worth checking out for cans, bottles, bombers, growlers and kegs of beer. While you can get some of these beers at select liquor stores and eateries in Alberta, this retail store is the only place you can get the Student Craft Beer series made by the students and seasonal beers by Old College Brewery’s head brewmaster. Plus, retail store sales support the program. This local family run business in Strathmore is one to visit. The brewery uses malting barley from its own fifth generation family farm to make its beers – one of which, the Last Post Brown Ale, won the best of show award at the 2018 Alberta Beer Awards. In total, Origin placed in the top three in four categories, which is pretty impressive considering the brewery is only a year old. Tours and tastings are available. Grizzly Paw’s brewery and brew pub are located at separate locations in Canmore, but there are reasons to visit them both. At the brewing facility, there are multiple tour times throughout the week and various tour packages. Plus, on Saturdays at 5 p.m., there’s a special tour that comes with a beer and cheese pairing in the brewery’s cellar. 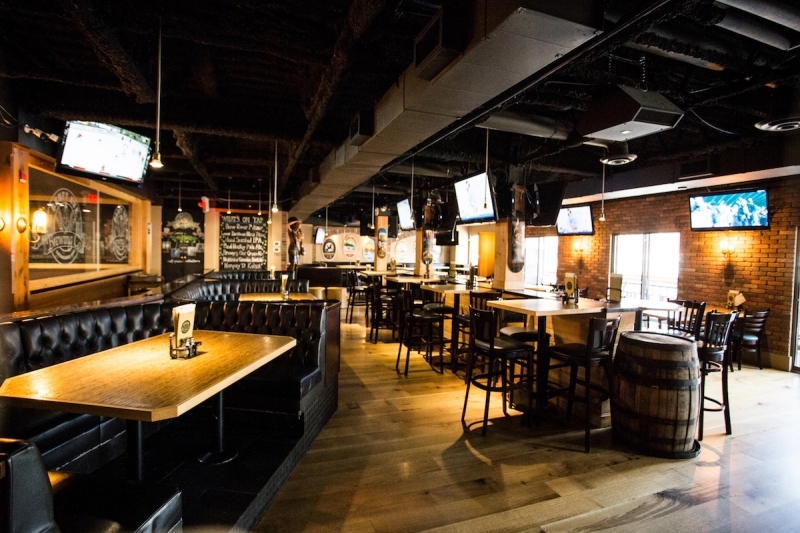 If you’re really hungry, drive a few minutes further into Canmore to reach the brew pub. You can dine on burgers, smoked brisket poutine or a steak sandwich and sip on a beer while taking in the view of the Three Sisters mountain range. Can’t sip on a pint? Try the soda-mocktails made with Grizzly Paw’s house made sodas or a soda tasting flight to try four of them. Red Deer’s Troubled Monk Brewery, which placed in six beer categories and tied for third place in the Brewery of the Year category at the 2018 Alberta Beer Awards, is just a playlist away from Calgary. While the award-winning beer is certainly worth trying, Troubled Monk also makes its own spirits (vodka and gin) and sodas (ginger ale and root beer). Sip on your drink of choice and eat light snacks like Sylvan Star cheese trays and popcorn cones in the brewery’s taproom.